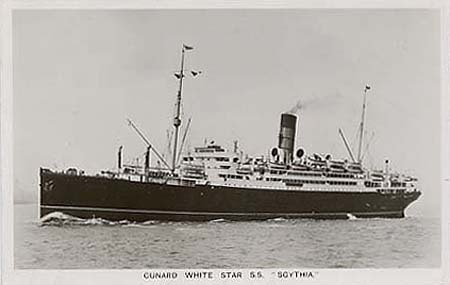 The Canadian Cunard-White Star liner "Scythia"
The voyage to America turned out to be more complicated than expected. 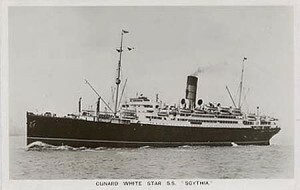 It involved a train trip to Paris, then another train to Le Havre where we boarded the Cunard-White Star liner, “Scythia.” The “Scythia”, while quite luxurious, was a ship that for many years had specialized in taking immigrants to Canada. Upon boarding it, I was overwhelmed by the hustle and bustle. People kept bumping into one another and saying, “Pardon me!” after each contact. I guess I could say that my first English sentence was “Pardon me,” or “Pardon.” I couldn’t understand why they just weren’t more careful when walking, but possibly that had not occurred to them. I also noticed that all these English-speaking people had very short names, names such as Bob, Joe, and Carl. And I also noticed a beautiful American girl with whom I instantly fell in love. However, she was eighteen and I was thirteen (the age of stirring hormones), and that was doomed to go nowhere. When we first met she introduced herself by one of those wonderful disyllabic names ending in “a” (unfortunately I don’t remember her name), and I introduced myself as A-lex-an-der, which then seemed the most embarrassingly long name in the world. How I longed for one of those short, English names! Had I only known that I could have, without cheating, made myself into an Alex! How much better that would have been! In any case, I was quite interested in the young lady, and she, while quite friendly to this strange, French speaking kid, was not interested at all. I wished it had been different! Once at sea, life settled down into a more or less permanent state of floating sea sickness. Each day I comforted myself with the thought that this could not be a permanent state, that I would feel better tomorrow, but I was wrong. 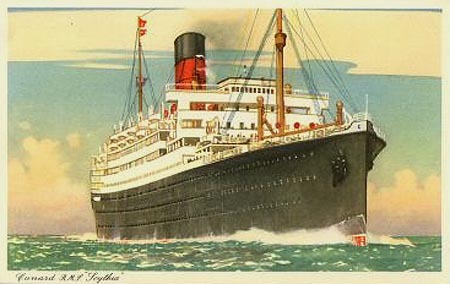 For the seven days of the voyage, I was miserable, sleepy, and with a queasy stomach. Again, I comforted myself with the thought that having been sea sick this time, on this trip, I would never be sea sick again. Wrong again. For the rest of my life, whenever on a ship, I’ve been miserably sea sick, sometimes more, sometimes less, but always sea sick when at sea. On this voyage I wasn’t so sea sick that I couldn’t participate in some of the social life of the ship which began each morning with what I considered an odd breakfast. Although I was familiar enough with eggs, at home they were a rarity for breakfast. Orange juice was also a novelty, and corn flakes were completely strange, and I had to watch others at the table to figure what to do with them. However, after a while I felt better and was able to play shuffleboard and deck tennis, which was not tennis at all. In the evening there were games involving cardboard horse races sped on by dice, which I never won, except for the time I had a bet on the slowest horse, the one that finished last. It was fun, but I would have liked it better had I won more often. After each meal there was a choice of activities, of which my favorite was the unlisted leaning over the metal railing of the ship, inhaling the cool,fresh air and up-chucking my meals into the often turbulent, grey-green ocean. Another view of the "Scythia"
This does not sound like a very romantic voyage. By the way, how was the food ? Was there anything fun to do during the day or did you read all day long ? Did you start learning English on board? Did you practice with the Hot girl with the name ending in “A”? How big was the room you slept in? How many people slept in a Room? I must have started learning English while watching American movies, but I wasn’t studying it formally. It just sort of stewed around in the back of my head. As to the “hot” girl, didn’t get a chance to practice anything, except maybe my English. My mother and I had our own cabin, and while not large it was adequate. We were not sleeping in a dormitory sort of arrangement. If eggs weren’t common for your breakfast at the time, what was common? And why was orange juice a novelty? Usual breakfast, for my mother and myself, and almost everyone else I knew was simply buttered bread (if we could get the butter), sometimes with a jam spread, and coffee. Orange juice and eggs were relative rarities (although not unknown), possibly because refrigerators or ice boxes were also comparatively rare. The Europe of those days was not the land of plenty it is today.